Once the poster-child of Catholic and Protestant divisions, Belfast has morphed into a bustling metropolis in the past decade. Efforts at building a lasting peace here are visible in architecture and in conversation. Like a phoenix, the city is rising from the ashes of sectarian fighting – more beautiful than ever – but with a still unsettled atmosphere that reminds its visitors and residents of the pain of recent history. Belfast City Hall, photo via wikipedia. Although Belfast is located on the Emerald Isle with the rest of Ireland, it is the possession of the United Kingdom, and has a decidedly British feel. To get your mind around the story that is Belfast, you have to tackle The Troubles. From 1968-1998, the city of Belfast, Northern Ireland was consumed in conflict. Southern Ireland was independent, but the North remained a divided world, where Catholics and Protestants split politically, socially, and economically. 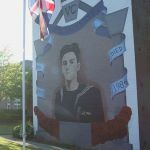 Walls were built between neighborhoods, and murals painted in honor of heroes from one side or the other. 1972 Donegall St. Car Bombing during the Troubles. Photo via wikipedia. The IRA fought the Ulster Defense Regiment. 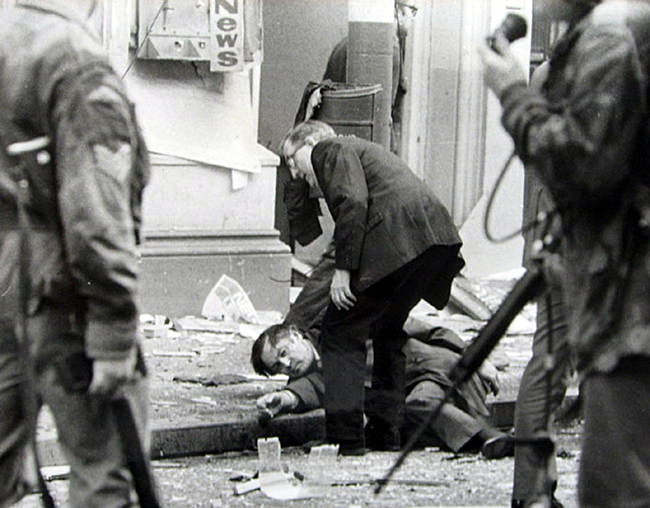 More than 3500 people died over the 30 year period of The Troubles, and violence was the way of life. Bitter feuds that began in Northern Ireland crossed borders into Ireland and England, and some stretched as far as Gibraltar. The Sunningdale attempt at peace in 1974 collapsed in failure. Stores opened and closed on political and religious lines, pubs were bombed. No one knew when the next bomb would explode, where, or who would be behind it. Tourism in Northern Ireland was a dream. 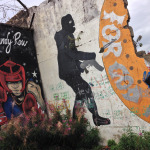 Today, the scars of Belfast’s history are still clearly visible. 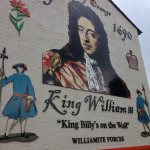 The city’s neighborhoods are marked as Protestant or Catholic by the British or Irish flag flying, and murals of either the Madonna or pictures of the Queen on the walls. School segregation based on religion is common, and “peace walls” are still being built. 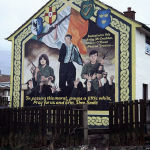 The Belfast Agreement of 1998, also known as the Good Friday Agreement, made its way into textbooks – and not as ‘just another attempt at peace.’ This unique agreement and the efforts at restorative justice and reconciliation that followed are studied by mediation and peace studies professionals as models of success. The leaders involved now travel globally to help create lasting peace in other conflict zones. 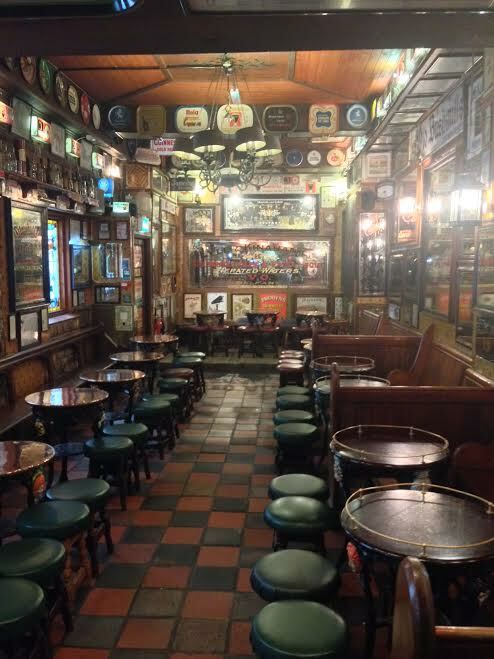 A pub in Belfast where the band Snow Patrol would frequent. Photo by Joe Dorsey. Belfast is at rest, after decades of entrenched fighting. The city’s newfound tranquility is marked by the occasional incident of violence, but most of the residents are tired of fighting. While some hold grudges, and physical scars remind others of the conflict, peace is in progress. The city is moving on, and creating a new reality. Out of the rubble, a mix of modern and Victorian architecture is rising, tourists are arriving in droves to visit the birthplace of the Titanic, and a new, still fragile peace is blooming. 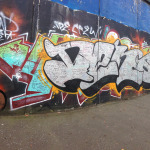 One charming feature of Belfast is the language – although it may prove difficult for non-locals to grasp. In addition to a thick brogue, a touch of Scottish influence can be detected in the pronunciation of vowels, and the inclusion of Scottish words in the local dialect. 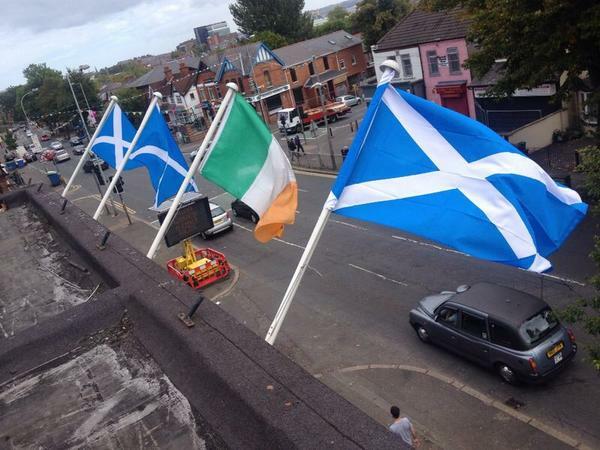 Irish and Scottish flags. Photo via RockBar Belfast. Linguists don’t count the Belfast dialect as a Scottish dialect, but it does come close. 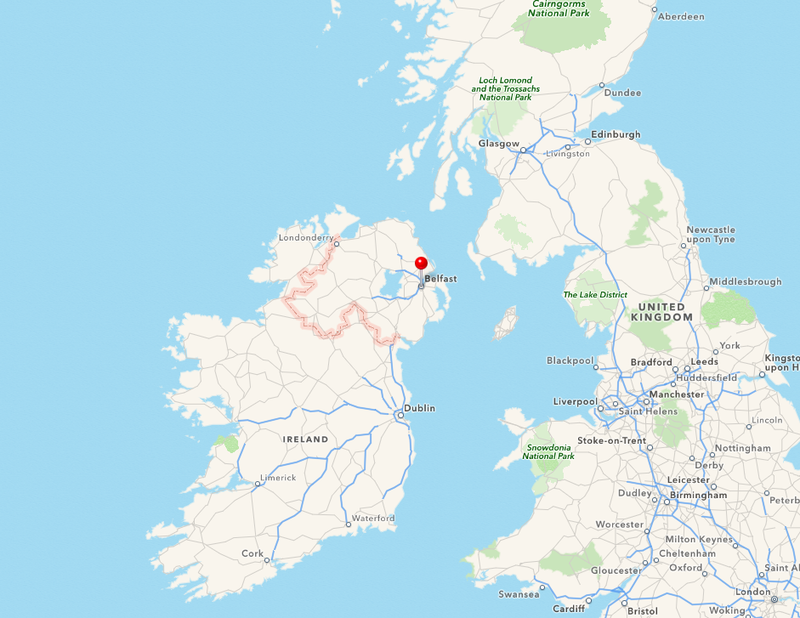 Linguistic artifacts, like the use of “for til” and “for to” are common, as well as words like “jouk,” “keek,” “thon,” “farl,” and quite a few more you won’t find in the rest of Ireland. Why is the Scots’ influence so prevalent? Because in the 1700s, many protestant Scotsmen were brought to colonize the area, under James I. Although most left shortly after they arrived, their influence remained. Belfast is close to Scotland, too – just 3 hours by car and ferry. The Giant’s Causeway, prismatic pillars of basalt reaching as high as 4 stories in some places, are rumored in folk tales to be the handiwork of Irish giant Finn McCool as a means to reach Scotland on foot. You’ll see the Scottish flag flying in neighborhoods signifying a Protestant influence there. The Troubles erupted out of Catholic discontent at Northern Ireland’s status as part of the United Kingdom. While the conflict has died down and peace has erupted, the city remains under British rule. That political difference has created a separate and distinct atmosphere in the city, one that sharply contrast with Dublin and other major cities in the Republic of Ireland. Although close in proximity, Irish and British cultures are distinct, but in Belfast, Northern Ireland they enrich each other. Now that you’re armed with the history of the city and a dash of its cultural intrigue, let’s dive in and visit some of its most fascinating sights. 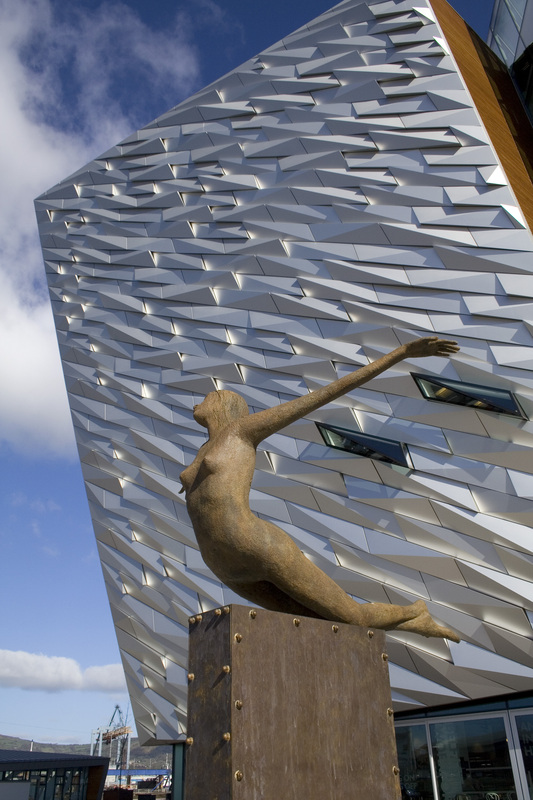 The premiere attraction for foreigners visiting Belfast is Titanic Belfast. 130,000 square feet of Titanic galleries, artifacts, movies, and a ride. The attraction tells the story of the ill fated RMS Titanic and its sister ship the HMHS Britannic. The Titanic was built in Belfast by the company Harland & Wolff, whose iconic yellow shipbuilding cranes still tower of Belfast to this day. Sculpture in front of the museum. Photo via wikipedia. It does not matter if you’ve already seen the movie Titanic or know the story of the ship i.e. “unsinkable” ship, iceberg, largest maritime disaster ever, 1500 deaths. Titanic Belfast is the definitive history of the ship as it relates to Belfast including exhibits like Boom Town Belfast, The Launch, The Maiden Voyage, The Sinking, and The Aftermath. The final gallery explores the Titanic as she is today, 12,000 feet below the surface of the North Atlantic. 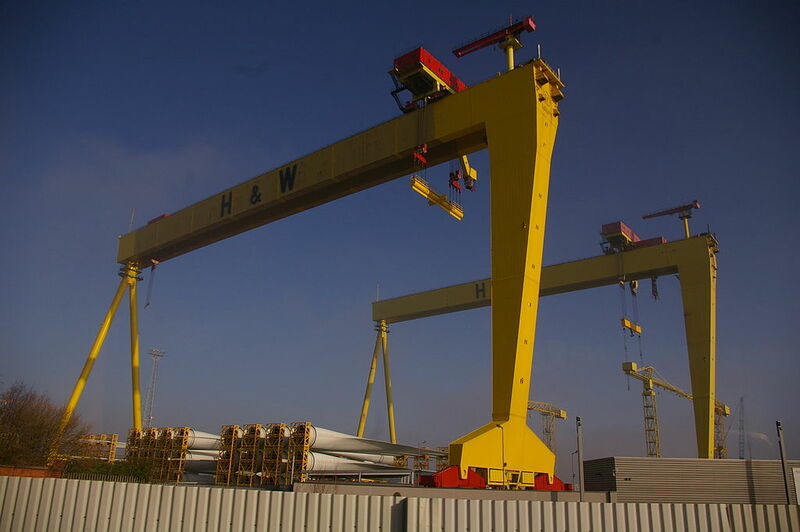 The type cranes that built the Titanic by Harland and Wolff. Photo via wikipedia. If you try to stay away from tourist attractions, you really shouldn’t in this case. The museum is very educational, informative, historically accurate, and quite frankly, fascinating. They really built a world-class attraction here. The Ulster Museum is an all-ages, interactive experience. Exhibits cover topic as varied as space and art. Best of all, the admission to this museum is free. The Discovery Art, Nature, and History centers offer younger children the chance to immerse themselves in play and learning, while older kids will enjoy the special activities that take place on a regular basis. This season, for example, you’ll find lantern-making to be a fun adventure for pre-teens. There is even an exhibit on The Troubles that will really help explain the timeline of events. There’s a nice cafe here, and the grounds are beautiful. If you’re an art lover, I would highly recommend a stop here. Ulster Museum. Photo via wikipedia. 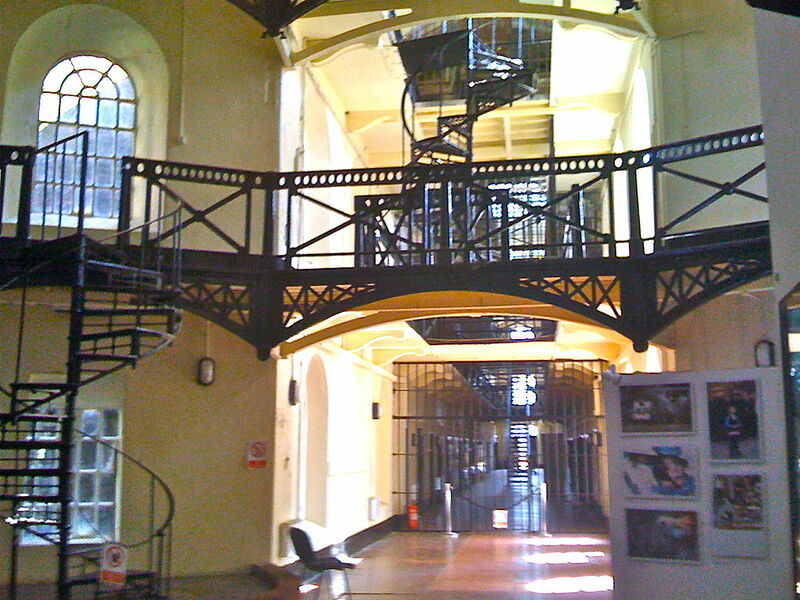 Decommissioned in 1996, the Crumlin Road Gaol is a popular destination for fans of ghost stories and haunted buildings today. I don’t know if I believe in ghosts, but this old jail is spooky enough that I might start. First opened in 1845, the jail was recently renovated and now hosts regular public tours, exhibitions, and history lessons for all of us. Men, women and children were once held here, and although executions were fairly common in the jail’s early days, the hospital wasn’t built until 1898. 5 years before it closed, an explosive device went off in the dining hall and two prisoners were killed. Unmarked graves of executed prisoners can be found on the grounds, too. Crumlin Road Jail. Photo via wikipedia. The tour of “The Crum” is spectacular, taking you through the process of the final moments of a condemned prisoner’s fate. The prison sits across the street from a derelict courthouse, which only adds to the drama of the area. The guards would transfer prisoners right from the courthouse into the jail through an underground corridor that will haunt your dreams. Crumlin Road Jail underground corridor. 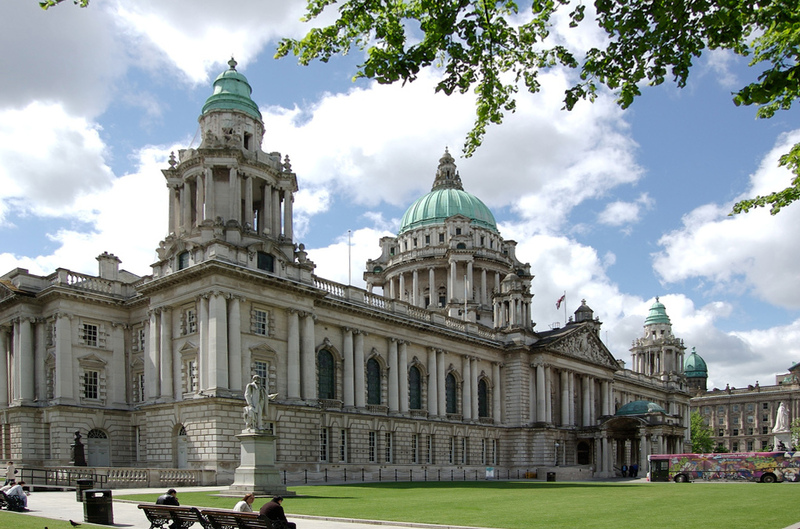 We’ve covered Titanic Belfast, Ulster Museum, and Crumlin Road Gaol, but Belfast has much more to offer. If you’ve got the time, check out the Lyric Theater, Cave Hill Country Park (great for teens and pre-teens), the W5 Children’s Museum, Falls Road, and the Botanic Gardens. Now that you’ve had an adventure, are you ready to eat? If you said “aye,” keep reading. If not, keep reading anyways…you won’t want to miss these vittles. Have You Tried an Ulster Breakfast? 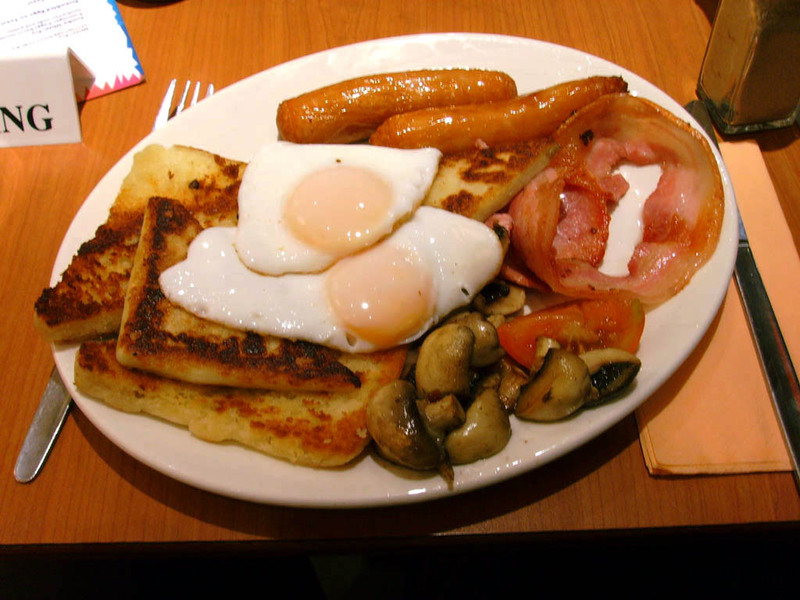 A close cousin of the Irish breakfast, the Ulster Fry is potentially the most widely-recognized Northern Irish dish. Bacon fat is the prime ingredient – for everything – meaning I can’t eat it. Ho hum…still looks divine. Ulster Fry includes bacon, sausages, black pudding, eggs, potato farl, and soda farl. Your cholesterol levels might soar to impressive heights if you eat this daily, but don’t worry. Once or twice a week won’t kill you….I think. Word has it that this breakfast is one everyone needs to try at least once in their lifetime. Assuming you eat pork. Ulster Fry Breakfast. Heart attack on a plate. Photo via wikipedia. Protip: Rumor has it that the Ulster Fry at Maggie May’s is divine. And Maggie May’s is worth the visit…you’ll see why. If you’d love to sip café in the presence of history, check out the Linen Hall Library. Inside, you’ll find a delightful little coffee shop, and oodles of information about Belfast’s history in the linen trade. The library was founded in 1788, and often hosts art exhibits as well as playing home to books. It’s the oldest library in Belfast and the oldest subscribing library in all of Ireland. Internet access, great coffee, gift shop, cultural events and exhibits, and last but not least, more than 250,000 items covering Irish history, with a particular focus on Northern Ireland’s political past…it’s one place you won’t want to miss. Looking for relatives? The library also boasts large genealogy and heraldry collections. For more information on a trip to Belfast visit the tourism board official site. "Imitation Game" History - How Mathematician Alan Turing Helped Saved the World.